mmm, this looks and sounds so good! but i’m terrified of cooking artichokes. my friend in college told me a horrible way to die from artichokes hahaha and now i’m scared i won’t clean it well enough and i’ll choke to death. yeah, i’m a loser. OMG what?! Please share this craziness. I have never cooked artichokes before… I don’t think I will never know how to cook them. Amen for artichokes! I’ve been waiting for them to go down to $1.50 each before buying them, but after reading this, there is no way I can wait that long! Oh man…arthichokes scare me (whole ones) but this looks so good! O-M-G, I just fixed steamed artichokes last night for my family and I wish this had been posted yesterday. I have gorgonzola and everything. *sigh* I’m trying this next time, looks amazing! 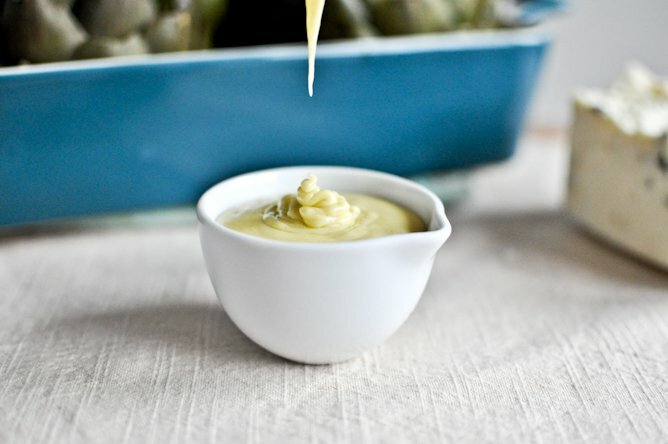 This recipe shows me how to cook two things I have always been afraid to cook – fresh artichokes & hollandaise sauce. Thanks for making it look do-able! These look amazing. We do artichokes here often. I have a wonderful spicy/tangy sauce that I make that my husband LOVES…but I think he’ll go for this recipe too. And for those of you afraid of cooking artichokes, don’t be! This method is good, or you can cut the top couple inches off, sit them in a steam basket over a couple inches of water & steam them for about 40-60 minutes ( depending on size). Feel free to drizzle olive oil/lemon juice in between the leaves & sprinkle your favorite herbs. You’ll know they’re done when an outside leaf pulls off easily. Use a teaspoon to scoop out the center sharp leaves & choke. Here in Santa Maria, Ca, we’re famous for our red oak bbqing, so we throw the chokes on the grill after steaming…just to get a little char and smoky flavor. Yum! I’m in love with this recipe. Love all of the herb flavors and parmesan hollandaise…omg. sounds so good. I love eating artichokes! It’s so fun to eat with your hands and race to get to the bottom to that tender heart. I have never had an artichoke in my life. These look good though and I would love to try the recipe. Artichokes are the regional vegetable of Brittany where I live. They grow everywhere, fields and fields of them, and I have them in my garden. You don’t need to be afraid of cooking artichokes, easy peasy. I made these last night and they were so good! For some reason artichokes were only $.89 a piece! Now, what to do with all the leftover herbs? When are you going to stop by with some of this fabo food…we could slurp wine for hours and then eat. Holy cow! I literally started to weep silently when I saw this. I am impressed, and hungry. I am amazed at the comments you got about artichokes…or more specifically, the fear of artichokes. I was a professional chef for many years and one of the restaurants I worked at featured artichokes stuffed quite like this as one of the appetizers…I did huge batches of them, remember, use a little vinegar in the water you boil them in. There are many subtle variations of the stuffing. One of my faves is to chop garlic and parsley with parmesan and stuff the artichokes…you can make them up a week in advance…bake them drizzled with olive oil and the liquid you cook them in in the baking pan. 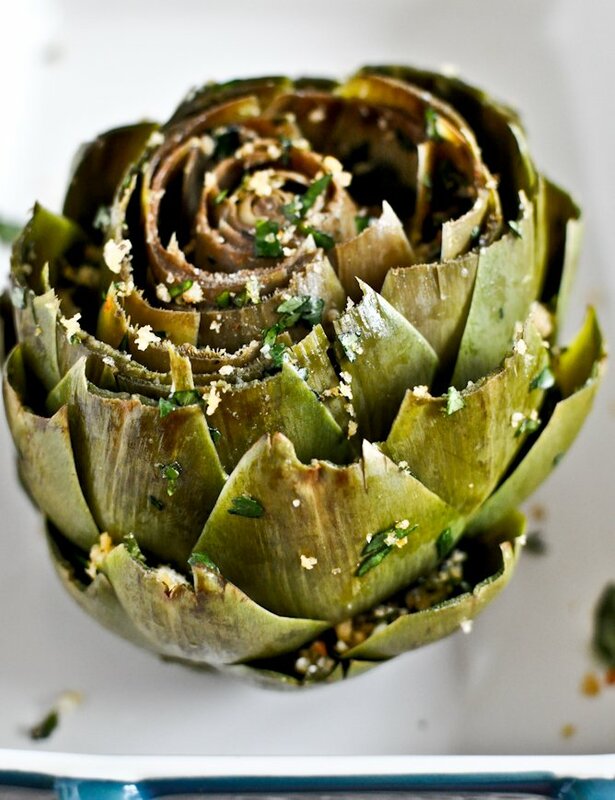 The, heat the crusty artichokes up in a microwave with the liquid….when you want them. I put an artichoke in a bowl with the liquid and cover it with another. I love artichokes, I have many artichoke plants in my garden. Today I had a big artichoke, simply boiled with a thick mustardy vinagrette. They are very good for you, a great source of iodine, if in addition to your artichoke paranoia, you are worried about goiters. Made this with some chokes my husband cut right out of a customers field that day and WOW!!! Left out the cilantro because I forgot it and dipped them in butter because I was too lazy to made the hollandaise. Husband said he will bring them home more often because that was sooooo good. Thank you!!!! Very interesting and appetizing recipe up to the point you ruin a hollandaise with parmesan. I’m flabbergasted at how many commenters have never had artichokes! Pure sacrilege! Love your idea of par boiling then baking. My kids love artichokes so much they burn their hands eating them as soon as they are drained from the pot…no butter, no dip…just gobble them up. Parents should embrace this veggie that is a fun project to eat! I had artichokes for the first time a few weeks ago, marinated, they were AWESOME. I bought some more when i was at Costco…I also ventured into the fresh produce section where I saw them $4.99 for 4 in a bag…I am thinking that is a great price. I am going to check BJs when I go there to see if they have them so I can try this recipe. When I cook my artichokes, I just put them a steamer basket (I have a pan that has one). The benefit of steaming them is you don’t get “water logged” tasting artichokes and vitamins don’t get leached out by boiling directly in the water. I usually steam them for about 45 to 60 minutes or until leaves appear loose and well cooked. I just made this for lunch and it was SO GOOD! This is definitely the best way to make artichokes, I will never again go back to just plain boiled ones. Great recipe! Skip the artichokes – drizzle sauce over poached salmon and broil. DEADLY!! !